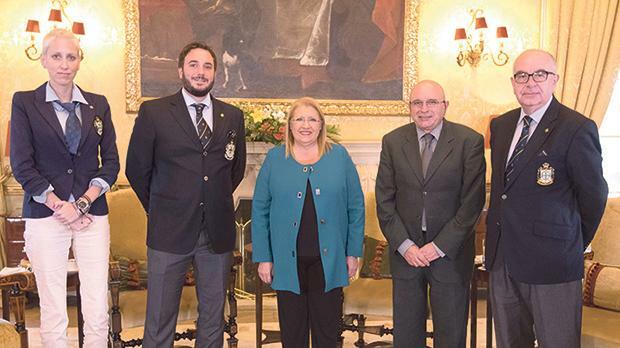 President Marie-Louis Coleiro Preca (centre) with, from left Dame Patricia Pedrazas Freeman, Chev. Francisco de Borbón Graf von Hardenberg, Dr Coleiro Preca’s secretary Carmel Briffa, and Chev. Carmel Bonello. The Grand Master of the Military and Hospitaller Order of St Lazarus of Jerusalem, Chev. Francisco de Borbón Graf von Hardenberg, paid a courtesy visit to President Marie-Louise Coleiro Preca at San Anton Palace during a visit to Malta. He presented Dr Coleiro Preca with two framed limited edition prints by one of Malta’s leading contemporary artists Luciano Micallef. These will be auctioned in one of the forthcoming auctions held by Malta Community Chest Fund (MCCF). The Order of St Lazarus is one of the most ancient of the European orders of chivalry, dating back to the 11th century. Today, the Order is an international self-governing, non-political, ecumenical body, having its own Constitution, while its membership is open to all men and women being practising members of the Christian faith. Its international membership consists of Roman-Catholic, Anglican, Protestant, Orthodox and other Christians, upholding the principles of Christianity with their lives, fortunes and honour. Its approximately 5,000 members in 54 jurisdictions in 37 countries, including Malta, are dedicated to the care and assistance of the poor and the sick, including lepers, and to promote and maintain the principles of Christian chivalry. Grand Master Francisco de Borbón was accompanied by Deputy Vice Grand Chancellor Dame Patricia Pedrazas Freeman and the Commander of the Grand Commandery of the Castello, Chev. Carmel Bonello.